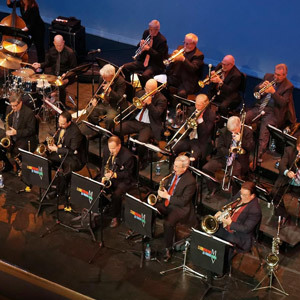 Made up of seasoned musicians who played in jazz legend Stan Kenton’s band, as well as in the bands of Maynard Ferguson, Woody Herman, Count Basie and other greats, the Stan Kenton Legacy Orchestra keeps the big-band flame burning brightly. With a focus on jazz education, they generously pass that flame along to a new generation of jazz artists. Enjoy a blazing set that’s “sharp and smokin’ from the outset, with never a letdown” (All About Jazz). ARTS EDU: Chapman University’s student jazz ensembles, led by Albert Alva, will open for both the Stan Kenton Legacy Orchestra and Gordon Goodwin’s Big Phat Band – and will join both ensembles for a rousing side-by-side finale!